Fears over how quickly the cost of living is accelerating in the UAE became very real on Wednesday when the Abu Dhabi Chamber of Commerce and Industry revealed inflation jumped to a record 14% last year. The chamber said in a report, citing government estimates, that inflation had soared in 2007 on the back of rising fuel, food and housing costs, reaching a peak of 15% during the year. The chamber described the situation as “alarming”. At 14% the UAE would be suffering from the highest level of inflation in the GCC and one of the highest in the world. The UAE has yet to release official inflation figures for 2007. The government said inflation stood at 9.3% in 2006 and nearly 4% in 2005. The chamber’s 2007 figure is significantly higher than previous estimates, which have put 2007 inflation at between 10.9% and 11.4%. Analysts have predicted inflation could touch 11.8% in 2008, but that could be eclipsed in light of the Abu Dhabi chamber’s findings, with fuel, food and housing costs continuing to rise this year. “Inflation has steadily risen over the past three years to reach an alarming level in 2007, when it was estimated at as high as 15%,” the chamber said, quoted UAE daily Emirates Business 24/7. “One of the root causes of this problem is the wave of hikes in petrol and diesel prices in the country, as such increases have led to higher construction costs, slashed the profit margin of the contractors and prompted house owners to raise rents sharply. The report will undoubtedly renew calls for the UAE to ditch its currency peg to the ailing US dollar, which has been blamed for increasing the cost of imports and restricting the central bank’s ability to fight inflation. The UAE’s dollar peg forces the central bank to track US monetary policy to maintain the relative attractiveness of the dirham. The US Federal Reserve has been slashing interest rates since September to stave off recession at a time when the UAE and other Gulf states should be hiking rates to rein in inflation. 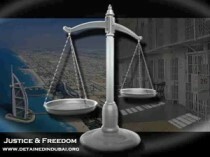 ArabianBusiness.com takes a look at some of the major extra costs residents in the UAE are facing. London’s West End is once again the world’s most expensive office market, but Dubai has now entered the top ten for the first time, according to CB Richard Ellis Group, Inc. (CBRE) Research’s semi-annual Global Market Rents survey. The report tracks world markets with the highest as well as fastest-growing occupancy costs for the 12 months ended March 31, 2008. Moscow climbed to second position whilst Tokyo’s Inner Central Five Wards, Mumbai’s Nariman Point and Tokyo’s Outer Central Five Wards rounded out the top five most expensive markets.